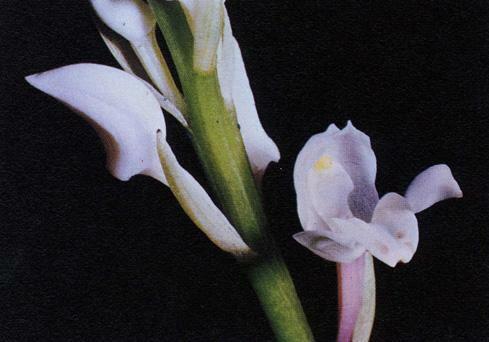 Govenia is a New World genus of terrestrial orchids widely distributed throughout the montane and pine-oak forests of Central and South America with a single species extending northward into south Florida. Roots are generally slender and fleshy with stems reduced to short, ovoid pseudobulbs. The deciduous leaves are pleated and veined and emerge from concentric, basal sheaths. The inflorescence also emerges from a sheath with few to many pale flowers that are resupinate and only partially open. 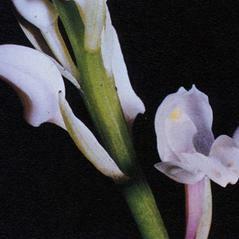 The dorsal sepal is concave and usually longer than the lateral sepals, and labellum is short and longitudinally concave.